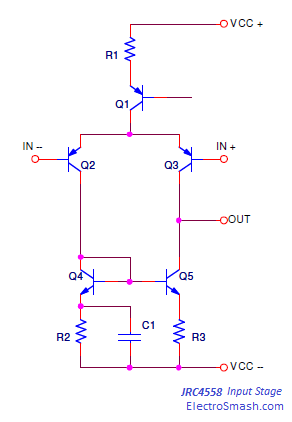 ) following the classic 741 type opamp structure with some modifications. 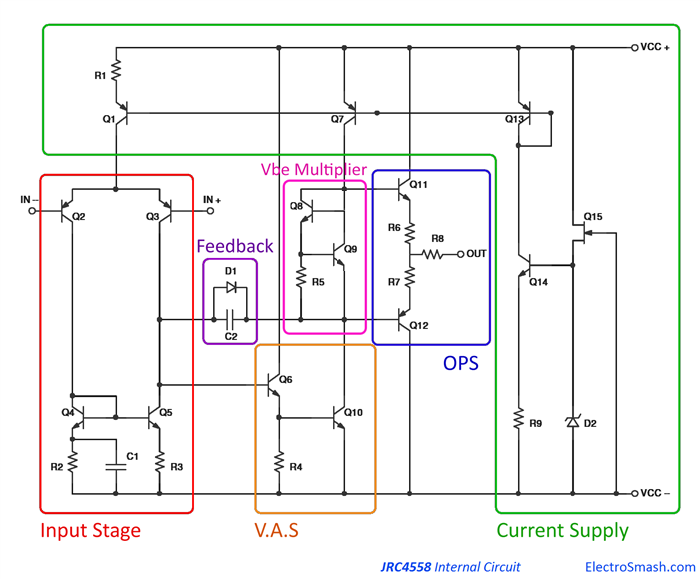 Find below the simplified circuit provided by JRC, broken down into blocks: Current Supply, Input Stage, Voltage Amplifier Stage (VAS), Output Stage (OPS) and Feedback Path. 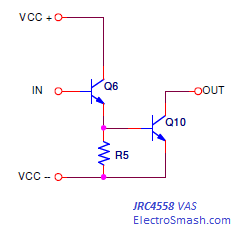 1.2.1 JRC4558 Long Tailed Pair Differential Amplifier. The output resistors R6, R7 and R8 inserted between output pair emitters also known as ballast resistors, are used to even out differences between internal emitter resistances of transistors, thus their current sharing is improved. 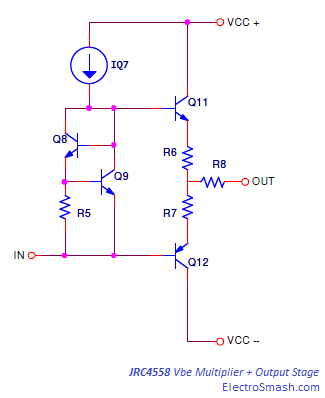 The resistor values are usually pretty low, improving thermal stability, preventing the complementary transistors from directly loading eachother and making quiescent current stable. The 4558 dual amp is linked with the history of the guitar pedals development. Many designers included this part in some of the most successful effects like the Orange Squeezer, DOD YJM 30, Boss OD1, Tube Screamer or Peavey equipment. This IC was undoubtedly chosen in the beginning by Japanese design engineers because it was one of the cheapest dual opamps on the market with acceptable audio performance. As such, it was used in huge volumes of Japanese audio equipment. Despite its questionable audio performance, it seems to be well suited to duty in overdrive circuits.